DEC21 0032EST. This evening brought high drama to the financial futures market. Within the narrow scope of a single minute, the benchmark financial futures contract -- the E-mini S&P 500 (ES) -- collapsed over 2 percent, falling from a reading of 1424.5 at 19:17:59 CST to only 1401 at 19:18:59 CST, and diving as low as 1391.25 within that fateful minute. 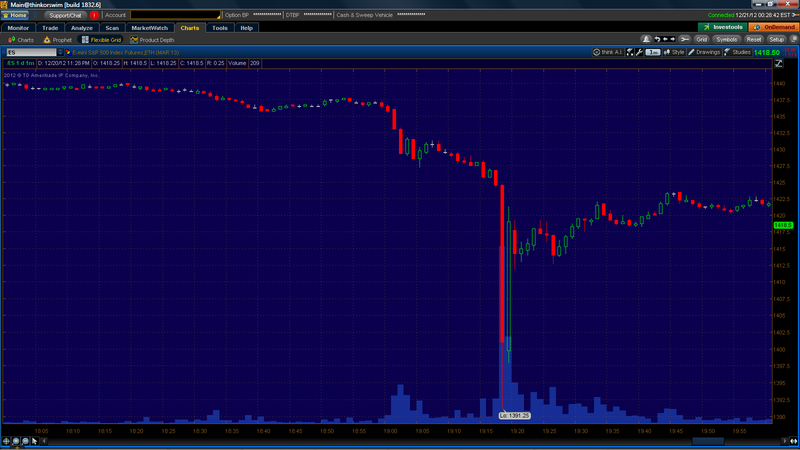 The contract recovered most of that drop in the subsequent minute. The impetus, of course, was Capitol Hill drama concerning the fiscal cliff. 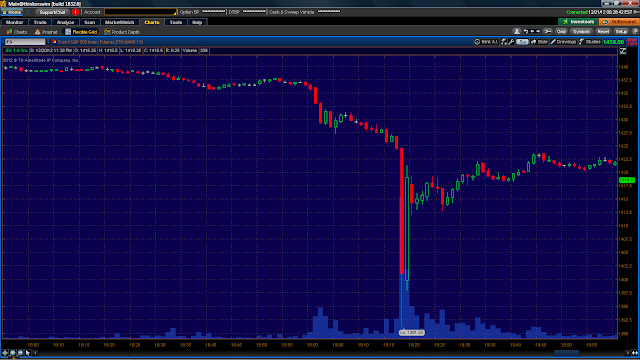 The chart of the whole convulsion, shown below, is eerily reminiscent of the May 2010 flash crash. ES (E-mini S&P 500 futures contract). Dec 20, 2012, 18:00 CST to 20:00 CST. 1-minute candles.